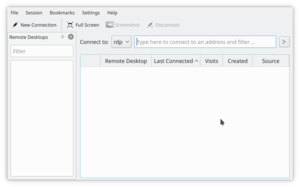 Krdc is one of a pair of KDE programs (Krfb is the other) that let you share your desktop through the local network with another user, probably somebody like the tech downstairs who you want to help you. Sharing your desktop can let her help you figure out something you are having trouble with. You can call the tech on the phone and be talking with her while she assists you. The tech can even "drive" your computer if you decide to let that happen. The guest screen (running Krdc) will show the pointer of the host if you select Session->Show local cursor, otherwise, the only evidence of the position of the host mouse pointer (as shown on the guest screen) is the hover effects. 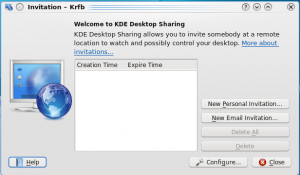 Krfb is one of a pair of KDE programs (Krdc is the other) that let you share your desktop through the local network with another user, probably somebody like the tech downstairs who you wants to help you figure out how to do something you are having trouble with. You can call the tech on the phone and be talking with her while she assists you. The tech can even "drive" your computer if you decide to let that happen. If the guest user clicks the print screen key, the screen capture tool Ksnapshot will launch on both guest and host. When you are working inside a graphic program, there is typically a tool for selecting the color of a piece of the graphic open in the program. Gimp has such a tool, for example. But if you are working in a browser and want to know about a color you find on a Web page, you'll need to use the Color Picker plasmoid. 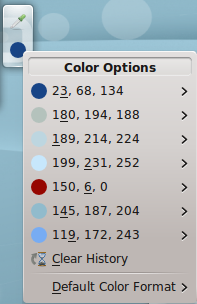 Like all plasmoids, you can set this one to be bigger or smaller, though it does not shrink smaller than the sizes of the icons which make up the Color Picker because they have a fixed size. Let's say I wanted to pick a screen color to use in a Gimp image. 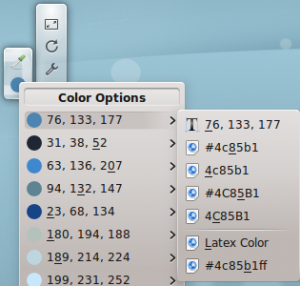 I'd pick the color with Color Picker, then choose the HTML coding format #bac4bd by clicking the picker's color circle and then clicking the desired format which also puts the color choice into the system clipboard. Finally, I would switch to my open Gimp image and click on the the foreground color tool and paste the color into the dialog blank. Gimp's default color format is the HTML format known as hexadecimal. The application you use may need a different format. In the worst case situation, you can retype the numbers in blanks when the application gives you a separate blank for each of the decimal values for red, green and blue (RGB) 186, 196, 189. This page was last modified on 16 June 2011, at 15:49. Content is available under Creative Commons License SA 4.0 unless otherwise noted.